I keep bouncing around in my posts between talking about movies, and talking about TV, of focusing on specific programs, and focusing on broader abstract issues relating to “the biz”. 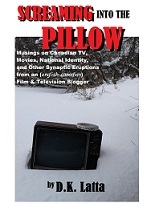 Primarily with a focus on Canadian culture and “pop” culture and identity. (And with the promise, albeit only occasionally acting upon that promise, of branching out to writing about other entertainment related topics, such as radio dramas, or not specifically Canadian things). And, as I’ve said before, for the moment I’m trying to post something every few days — which can lead to a certain repetition of theme, or focusing on parochial subjects. Anyway, today I wanted to muse about two current Canadian TV series (particularly in regards to recent episodes) — the medical drama, Saving Hope, and the sci-fi drama, Continuum. Since it’s the summer, most Canadian series are either on hiatus, or in re-runs, or, in the case of Rookie Blue, in a later season and chugging along quite nicely. So Saving Hope and Continuum are the two main “new” series — the fresh produce, as it were, for a critical chewing over. Hence why I’ve alluded to them a couple of times before. I haven’t been a big fan of either series, though their ratings are so far pretty good. Saving Hope, inparticular, has held pretty firmly to a million and half viewers every week (not to mention another few hundred thousand in a later-in-the-week re-broadcast) which by Canadian standards is exceptionally good. Whatever its US numbers (it’s simulcast on NBC) there’s no disputing its Canadian numbers are strong. Continuum opened with almost a million viewers in Canada — exceptional for a cable series — but unlike Saving Hope, it hasn’t held those numbers, sloughing off more than half within a few episodes. But that’s still decent, assuming those numbers plateau as opposed to continue to drop. Now because I write film and TV reviews for my site, The Great Canadian Guide to the Movies (& TV) I make the effort to watch a few episodes of Canadian series — even when I’m not that impressed. I realize that one or two episodes aren’t always a good way to assess a weekly TV series. My rule is I try to watch three episodes before forming an opinion, and usually more — indeed, the more ambivalent I am about a series, the more episodes I might watch. The irony is I sometimes end up seeing more episodes of a series I’m cool on than a series I decide I like within a couple of episode! So even though I’ve been ambivalent about both series, I’ve watched most episodes to date (about five or six each) kind of hoping it will tip me over into its camp — or, conversely, convince me it’s irredeemably awful. And so that’s where it becomes interesting, as we come to last week’s episodes. As I said, I’ve been watching Saving Hope, and it hasn’t quite clicked for me. I didn’t hate it — the actors are fine, the scenes okay, there’s nothing egregiously terrible about it. But it did feel a bit bland, a bit generic. And this despite the quirky gimmick of adding a supernatural element in that a comatose character wanders the halls in a spectral form, commenting sagely on the action. The problem with that was it hasn’t been one thing or the other. It’s there, but they don’t seem fully willing to commit to a supernatural vibe. There’s nothing else about the series that’s off beat or mystical — it ain’t ER crossed with Twin Peaks or anything. The spectre (played by Michael Shanks) has little impact on the real world stories — you could edit his scenes out and the episodes would unfold pretty much the same way. And there aren’t really “plots” he’s following either. His scenes basically just involve him reaffirming his desire to wake up (or being exhorted to reaffirm his desire to wake up by another spirit) — and then we just hit re-play next episode. Of course, that might be deliberate. After all, a major problem with the coma plot is that we suspect he can’t ever wake up, because the series would lose that plot thread. But…given how kind of peripheral it is, maybe they figure they can wake him up anytime they want…and the series can then proceed as just a straight medical drama ala Chicago Hope or Grey’s Anatomy. Who knows? (According to one article, the TO BE supernatural or NOT TO BE supernatural debate has been a behind-the-scenes struggle on the show, perhaps explaining the problem). As a run-of-the-mill medical drama I hadn’t really been finding the cases of the week that well presented (as “stories”, building either to emotional denouements, or at least House-style medical mysteries). And despite a perfectly good cast, a lot of the character’s themselves strike me as a bit bland and ill-defined, particularly the ostensible leads Alex and Charlie played by Erica Durance and Shanks respectively. Indeed, maybe it would’ve been interesting to have it be that Shanks’ Charlie — though nice enough to have been Alex’s fiancee — wasn’t entirely a nice guy guys as far as others were concerned (maybe as chief of surgery he was a bit of a martinet) so that as his astral self wanders the halls, he discovers a lot of people who aren’t exactly shedding any tears for his predicament. Y’know, the old “a man only discovers the truth about himself when it may be too late to learn from that discovery” idea…so that we could imagine the Charlie who woke up from his coma (if the character ever does) might be a different person, spiritually, than the one who went into the coma. Just a thought. Anyway, so I’d been watching a few episodes, initially ambivalent but, honestly, losing even that affection for it. And then we come to the most recent episode, written, I believe, by Sherry White — the one with Matt Gordon as an, initially, amnesiac patient with a metal rod in his chest, and Peter Keleghan as a stage show hypnotist (as well as Joanna Douglas as a schizophrenic). So, firstly — a good guest star cast (not that I’ve had any issues with Saving Hope’s casting choices). And…and…well, actually, it was pretty good. The Gordon plot unfolded like a good puzzle box, the answer to one question posing another question — what a good plot should be. Not just introducing a dilemma, then flogging it for 45 minutes plus commercials. Keleghan’s role was introduced as part of Gordon’s plot…then branched off into a separate plot (again, a clever narrative progression) as we learn he can see Shank’s character. Now, on one hand, it could threaten to make the episode too cutesy — steering the series into more blatantly fantasy waters that it had hitherto been reluctant to navigate. But viewed another way: that’s the point! It finally allowed the fantasy aspect to be part of the main story. There’s some comedy shtick (Keleghan being a very reluctant medium) and though the conclusion is foreordained (Durance’s character won’t believe him…otherwise, it would affect all later episodes) the reason is more convincingly handled, and true to the relative characters, than you might expect for a “Gilligan’s Island” plot (ie: where the status quo must be resumed by the end of the episode). The episode also had an underlining cynicism toward the medical profession which is unusual in medical series, as both Gordon’s plot and Douglas’ plot don’t provide any easy solutions. As well, a scene where the doctors are discussing various philosophies toward treatment (defining something as the “ER approach” — basically more concerned with treating symptoms than causes, simply to get rid of the patient) is probably true of more doctors than most of us would like to believe…and makes you wonder if the script writer had had her own unsatisfying encounters with Hippocrates’ disciples. Not that you’d want to do that every episode — it is, after all, entertainment. But it was a little bracing and refreshing. The point is: it was a pretty good episode. The various plots were paced out well, and offered some twists and turns to hold you through the commercial breaks. There was comedy, drama, and pathos. The downside is it still didn’t necessarily jump any bars. It didn’t necessarily redefine the series and characters for me and suggest this was the start of greatness (the way some series will do an episode where a hitherto bland character suddenly clicks and ever after they become one of your favourite characters). The characters are still what they are, and honestly, with some of the supporting characters/players (such as Julia Taylor Ross, Kristopher Turner, and even Ben Ayres) more intriguing than the leads (Ayres perhaps more just because, as an actor, he’s starting to grow on me after J-Pod and Dan for Mayor, rather than because his character is anything to write home about). It simply showed that the series could rise up and bring its A game. Whether it can do so consistently — well, I guess I’ll have to watch another couple of episodes before settling on a review! Addendum added July 31: Relating to Saving Hope (for those keeping track) the next episode after the one I described was back to being a bit more iffy, but the one after was quite strong. Billed as a kind of mid-season finale (as the series breaks for Olympics coverage) it featured a compelling Brian Markinson as a disturbed police officer. As well, regulars Erica Durance and Michael Shanks seemed to be given stronger material to play — Durance especially, as the episode involved a struggle over who had the right to make decisions for the comatose Charlie. Instead of playing it simply good/bad, there was some nice ambiguity, Durance’s character clearly teetering on an emotional edge herself, and with equally nice work from Michelle Nolden. Granted, I suspect the whole technical/legal stuff was a bit loose and I’m not sure realistic (partly, I’m guessing, because of the series’ desperate need to not be too Canadian or too American in its setting). So two strong episodes almost back to back…maybe bodes well for the series finding its legs. I should also point out that I’ve barely alluded to fellow lead, Daniel Gillies — but that’s not a swipe at him. Like with Durance and Shanks I think he’s struggling with a character that could be written better, but I have nothing against his acting talents. This entry was posted in Canadian film and TV and tagged Continuum, Erica Durance, Michael Shanks, Peter Keleghan, Saving Hope. Bookmark the permalink.